injured up to 20 people. Antwerp police said in a statement late Monday that most of the injuries were slight. Authorities rescued seven people from under the rubble. The explosion ripped through the homes late in the evening. 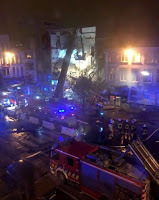 Antwerp police quickly announced that the blast was not part of a terror attack. At least one building totally collapsed. Rescue workers were still going through the debris around midnight.